I had this overwhelming feeling of reminiscence today and my inclination was to throw on this varsity jacket that turned this pretty little Reformation dress into a borrowed-from-my-boyfriend-after-dinner-at-the-diner look. The varsity jacket is a comfort piece to me, which reminds me of the good old - no, actually young, easy days of my life, to when I wish I could go back and make more out of that precious time. If you're still in high school, revel every moment you can! I'm serious - when all there is to worry about is getting your homework done and picking your perfect dress out for winter formal. I know I'm not old, but I'm not getting younger. What we adults have left are the daydreams of work that really wasn't work and fun that could be uninterrupted and endless. Don't get me wrong, we adapt to our adulthood to find the joy in our lives and there are even a lucky few who don't work at all while pursuing their lifelong passion. And, actually, we even treasure our carefree moments a lot more than our younger selves would have. But if I could tell my younger self something, I'd say don't waste any free moment you have, if something doesn't put a smile on your face and warmth in your heart. Keep forever young. P.S., was that just an early sign of a quarter-life crisis? That's a fact of nature law. A great outfit! 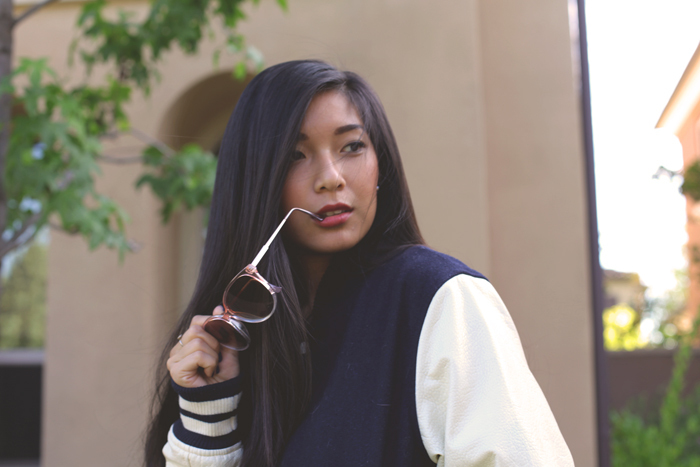 A throwback yet totally on trend :) You are totally rocking the varsity jacket! !